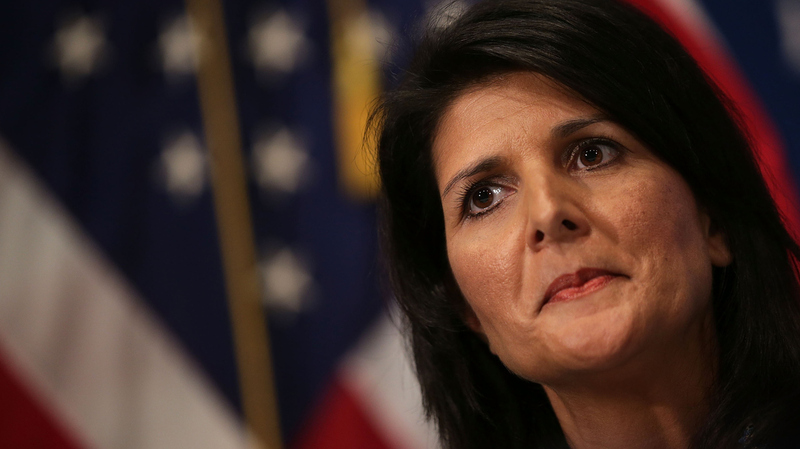 Trump And Supporters Hit Back At Nikki Haley's Jabs The South Carolina governor says she did have Donald Trump in mind when she criticized the "angriest voices" within the GOP in her State of the Union response. South Carolina Gov. Nikki Haley gave the Republican response following President Obama's final State of the Union speech on Tuesday night. South Carolina Gov. Nikki Haley says she had Donald Trump in mind when she criticized the "angriest voices" within the GOP in her State of the Union response. "Mr. Trump has definitely contributed to what I think is just irresponsible talk," as have others in the media, in her state and across the country, Haley said on NBC's Today show Wednesday morning. During her GOP address Tuesday night, following President Obama's final State of the Union address, Haley was quite critical of some of the current rhetoric in the Republican Party. She made what many saw as criticisms of the controversial GOP presidential candidate. "Today, we live in a time of threats like few others in recent memory. During anxious times, it can be tempting to follow the siren call of the angriest voices. We must resist that temptation," Haley said Tuesday evening. And given Trump's proposal to stop Muslims from coming into the country, Haley noted she was the daughter of Indian immigrants and that the U.S. should welcome "properly vetted legal immigrants, regardless of their race or religion. Just like we have for centuries." Some of Trump's staunchest defenders took shots at Haley over her criticisms though, notably conservative author and commentator Ann Coulter and conservative radio host Laura Ingraham. Nikki Haley says "welcoming properly vetted legal immigrants, regardless of religion." Translation: let in all the Muslims. Trump responded to Haley's comments Wednesday, calling in to Fox & Friends. "She's weak on illegal immigration, and she certainly has no trouble asking me for campaign contributions," Trump said. "I feel very strongly about illegal immigration. She doesn't, and I think the people in her great state, I love her state, I'm there a lot, and by the way I have a massive lead in South Carolina. We have a massive lead. They're incredible people, and they feel like I do. Believe me. Because they don't like what's happening in our country," he continued. Haley's response was widely praised, including by many Democrats, and her performance has only increased speculation that she would be a top pick to be the vice presidential nominee.